Glossy loaves of homemade bread. No big deal. Maybe because I bake bread so much, friends give me cookbooks about it. I just pulled one of them off the shelf that has nearly 200 recipes. I just use one way but it's really good and I've used it for years. There is something indelibly special about your own bread just out of the oven. I grew up spoiled by that just-baked taste. My pop worked the night shift — what they called "the lobster shift" — at a newspaper printing plant when I was a kid, and he'd stop before daylight at a Jewish bakery on the way home. He'd sit around talking union stuff with the bakers while they waited for the next batch to come out of their big commercial ovens. 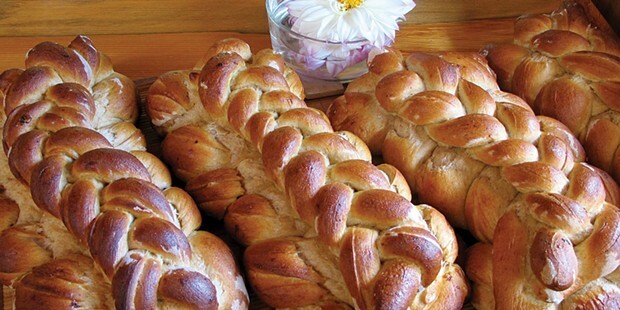 He'd bring a loaf home, still hot — pungent ryes, smoky pumpernickels, voluptuous braided challahs. They'd still be warm when I woke. Spoiled. I was spoiled. I tried lots of bread recipes over the years, but the one that worked best for me is what bakers call "sponge-method." It starts with all of the sweetener, all the warm liquid, the yeast and a fraction of the flour stirred together into a sticky paste. Then it sits; the yeast wakes up and the dough rises. When you return later, you start adding in additional ingredients. Maybe some salt, some vegetable oil, some egg white. I use whole wheat flour for the sponge because it has benefits for health and taste, but for the finishing stage I use white flour, the kind made especially for bread. In the end you have dough to make two gorgeous loaves, but the dough has other uses, as well: pizza crust, braids, cinnamon rolls, crackers, even English muffins. It's not Jewish bakery bread but no one has complained so far. Instead, loaves go to destinations like fundraising dinners, for people demonstrating for Standing Rock and to my neighbors, whom I want to spoil the way I was as a kid. After several years I started teaching bread making every fall in Orleans and the classes grew every year. There were many beginner bakers but also some veterans. Three generations of one family came from Hoopa last year and another from Orleans came with four generations. With the help of a food security grant from the USDA, we gave the bakers lots of flour — last year 1,200 pounds — and yeast so they could keep on baking when they got home. We called it "Bread University" with the slogan: "Like other universities but tastier." I'm not teaching this year but the Orleans food security team is sponsoring another baking class this fall, this time featuring sourdough and morning buns. The teacher is Melinda Stearns and the class is free. It's at the Panamnik Building on State Route 96 on Saturday, Dec. 17, at 10 a.m. Call Grant Gilkison at (530) 627-3202 to find out more. I have always wanted to learn sourdough. I'll be there. While you wait for the class, here's the recipe for sponge method bread (although you won't need a recipe after the second or third round, it's that easy). First, make the sponge starter. Warm the bowl with hot tap water, then dump it out. Pour in the 3 cups of hot water, then add 2 tablespoons of sugar or, if you like it sweeter, up to 1/3 cup (if nobody around is diabetic). Pour in enough whole wheat bread flour to make a batter thicker than pancake batter. It can be very thick but still a little sticky. Always add the flour before the yeast. Use as little as 1 teaspoon of yeast if it's going to sit all day; use as much as a tablespoon if you want to go to the next step within a couple of hours. I've gotten more generous with yeast since I started buying two-pound bags of it at Costco. Stir the mixture until it is uniform. Unlike pancake batter, it's OK to stir it a lot. Then let it sit. Begin the first kneading. After the sponge has fizzed up to at least double volume, whip it with a big spoon until it's smooth. Add the vegetable oil and 2 eggs, reserving 1 yolk for glazing. If you like, you can add 1 teaspoon of salt and/or 2 tablespoons of caraway or other fragrant seeds per loaf. Beat the mixture again until the ingredients are mixed in. Gradually add the white bread flour and keep beating until it's hard to stir. Spill it all out on to a floured work surface, dusting the top of the mass with more flour. Knead and fold the dough over itself, adding flour underneath and on top so it doesn't stick. When it stops being sticky, it has enough flour. There is no danger that it will take up too much flour. Keep kneading until it develops an elasticity that won't let you fold or squash it anymore. Rest the dough before the second knead. Sometimes I let it rest for 20-40 minutes so the gluten relaxes and then I knead it some more. The first kneading takes a while but the dough becomes resistant much faster the second round. Divide the dough in half and drop it into 2 well-oiled pans to rise, doubling in size. For braids, repeat the kneading and folding 4 or 5 times instead of just twice. Then cut the dough into four equal pieces. Roll three pieces into ropes and braid. Cut the fourth into three, roll them and braid. Lay the thinner braid on the larger one. You can braid each loaf of dough or combine them for a big show-biz braid. Rising time is variable. It depends on the amount and activity of the yeast, and the room temperature, but you want it to at least double in size. Keep watch: If it sits too long after it has stopped rising, it can fall during baking. For the glaze, beat an egg yolk with 1 heaping tablespoon of sugar and brush it on top of the loaves. Sprinkle them with sesame or poppy seeds. Bake at 350F for 50-60 minutes. It's OK to start with a cold oven. The applause step: Pretend modesty. Say, "It's really not very hard." Or, "I just like to make people happy." People will also politely ask how soon you can cut bread after it comes out of the oven. Tell them they can cut it as soon as they count to 10, but only if they have a bread knife with a serrated edge.